To meet artist Randy Chollette is to be struck by his genuine warmth and humility. A quiet man who conducts himself with purpose and care there is a sparkle in his eye revealing the light within his spirit. A popular local artist, Chollette’s work is rapidly gaining international acclaim, and to be sure it will not be long until before the cognoscenti come calling. Born and raised in the Cayman Islands, Chollette’s homeland often plays muse, inspiring some of his best work as he documents his beloved country of past and present, and noting that with the acquisition of modern amenities certain traditions are doomed to disappear. His landscapes document a simple way of life that is quintessentially Caymanian, entirely Caribbean: Catboats return to shore after a long day toiling on the high seas in pursuit of turtles; traditional stilted wattle and daub houses nestle neatly by the seaside, revealing the intimate relationship one has with the ocean in the Caribbean; characters, bent and busy, cultivate the dry, unyielding land. His kaleidoscopic abstracts, appearing lit from within, are often diaphanous, multi-hued impressions that seethe with energy and emphasise emotion, inspiring thoughtful reflection as they reveal their hidden secrets. As a whole his work eschews the materialistic nature of the modern world, choosing rather to celebrate a time when life was, as of yet, uncomplicated by the demands of contemporary society. Paintings like ‘Banana Man’, ‘Magenta Sunrise’ and ‘Aunty Mango’, exhibit his unique translation of the energy within the void that, according to him, is behind everything in life. As Chollette sees it, this energy is in constant motion, connected to all things, and thus aptly expressed through interlocking mosaics and curving black lines delineating the movement of water, air and matter. With a colour palette often incorporating red and green as a nod to the Ethiopian flag and the evolution of the Rastafarian faith, Chollette has recently embraced the use of brilliant yellow as a means of capturing the vitality of universal energy. His most recent abstracts also integrate the iconic Caribbean blue and are distinguished by a greater intensity of colour saturation centred at the midpoint of the canvas, serenely radiating outwards with a gentle luminosity. In general, his abstracts glow with a mystical vibrancy drawing the viewer into their depths, as is observed in ‘Therefore the Sage’. Chollette’s earlier works, such as ‘By the Bay 2’, are characteristically direct and naïve, whereas more recent paintings are variations of his earlier approach, but convey greater depth and maturity in their application. His years spent honing his craft to allow mastery of the spatula and palette knife are displayed in ‘Homeward Bound’, while ‘By the Waters of Dharma’ reveals his deft brush use to produce deliberate, textural renderings that are indicative of an impressionistic approach. Not entirely pointillism, Chollette’s application of small blocks of colour is more about the merging and building up the structure of the paint rather than the precise execution of pigment. A purist, Chollette only works in oil paints – no thinning, mixing or additional mediums – generating immediate high relief on his canvas. Accentuating the tactile quality of his painting, Chollette occasionally uses Sgraffito, a technique in which some of the wet paint is repeatedly scraped off to reveal the layers underneath. By applying more than one colour at a time – to create an immediate blended effect – Chollette further emphasises the dissemination of hard lines and shapes. ‘Tree of Life’ is a recent example of this particular method which, although a stylistic departure, is yet another example of the multifaceted ability and professional curiosity of this talented artist. 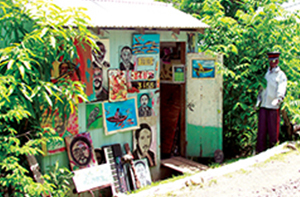 Joining local Caymanian art collective, Native Sons, in 2000, the past winner of the esteemed McCoy Prize for the Arts, Chollette’s paintings can be found in both the National Gallery of the Cayman Islands and the Cayman Islands National Museum. Displayed at the London Office of Tourism for the Cayman Island and gracing the walls of many homes and public institutions, his work is often on display at The Gallery in The Ritz- Carlton and Body Works Holistic Wellness Centre in Grand Cayman. Despite canvases that pulse with colour there is an indescribable contentment, a quiet that one feels upon viewing Chollette’s work, a gentle calm that washes forth and seizes the soul. Possibly an express consequence of his intention to share the positive energy he sees flowing from one being to another, or perhaps the result of his effort to transform the way we think of the past by reminding us of its precious link to the present and future. Whatever the root cause of this calm, the result is plain for all to see: his art transcends the canvas, engaging the viewer in an intriguing soul connection – a graphic reminder that, where the enigmatic Chollette is concerned, still waters run deep.